Christmas Ornaments Made in USA - Cranberry Red Crystal Glass Two Inch Ornament Ball (set of 3 - A Christmas Ornament Co.
All our hand-made ornaments are of heirloom quality and will undoubtedly last for generations. Discover the near-extinct art of glass-blowing with any of the hand-crafted ornaments we offer. Our ornaments are created using either the "free-blowing" process or having the glass blown into a mold. The quality is extraordinary and these will last for generations - even with not so gentle handling!!! 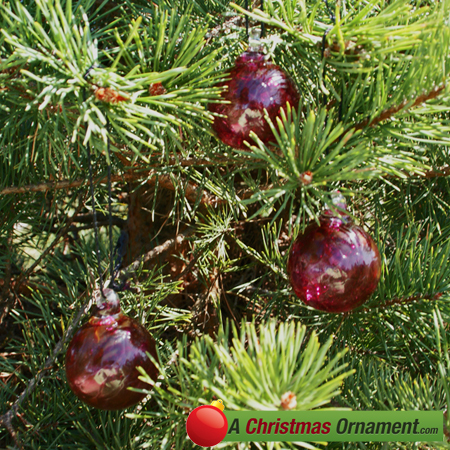 These beautiful Cranberry Red ornaments are "free-blown." Makes a fantastic gift for anyone. This set of three Christmas ornaments are made by a glass blowing company that have been in the business for 80 years. Crafted with pride by artisans in the U.S.A. Each ornament measures two inches across.